There are many interesting legends prevalent in Itumbahal. The foundation of Itumbahal and consequent events, happened in Itumbahal during the medieval period, which has been heard through generation to generation, came down as superb legends of the monastery. The verbal recitation of legends from one generation to another generation and the gossips about Keshchandra, Gurumapa at the gatherings in Itumbahal are the sources of those legends. 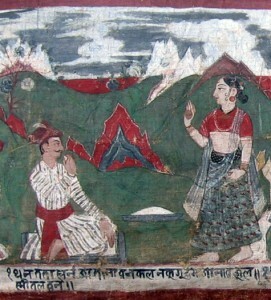 The Bilanpau or scroll painting, which is displayed proudly at the premises of Itumbahal, vividly pasteurizes the events following foundation of Itumbahal. While the life is running peacefully, the Gurumapa became a headache for the Keshchandra. Gurumapa -even though he was served fully satisfied he developed the habit of cannibalism. He stole small kids in the neighbourhood and eat them. The habit of Gurumapa to eat small kids alarmed Keshchandra and the neighbors. Gurumapa is so much feared that mother’s use to threaten their unrelenting, crying small kids, ‘do stop crying or else Gurumapa will take you away!’ The kids remain ‘pin drop’ silence with just the mentioning of the name of Gurumapa. As time passed Gurumapa became so much aggressive that even, a small only son of Keshchandra became victim of Gurumapa’s cannibalism. Then disheartened Keshchandra, decided to dump him in the open field of Tudikhel and serve a mun of rice and meat onece in a year, with this, brought a peace of mind in Itumbahal neighbourhood. The tradition of serving Gurumapa once in a year is still observed during the end of Holi festivals. This legend tells us about how does the Itumbahal came into existence. Itumbahal is believed to be construct by Keshchandra, with all his gold brought into Vihara, with the help of Gurumapa. There is no written evidence like inscription, to commemorate the date of establishment.